Ritherdon & Co was founded in Great Moor St, Bolton by the current Managing Director’s great grandfather, Percy Ritherdon. The company moved to North Bridge Mill, White Lion Brow shortly after that and remained there until just after the Second World War. Percy’s interest in chemistry and magic led to a unusual range of Ritherdon products: intially concentrating on electroplating and enamelling for the Edwardian bicycle boom, but also on making tricks for magicians. Percy worked closely with the magician Chung Ling Soo for several years in the early 20th Century and there was a locked workshop at North Bridge Mill where a select group of Ritherdon employees worked on the very precise fabrication of these magical tricks. More details on Percy Ritherdon’s collaboration with Soo and some of the tricks that Ritherdons made, are given in Jim Steinmeyer’s book The Glorious Deception: The Double Life of William Robinson, aka Chung Ling Soo, the “Marvelous Chinese Conjurer”. 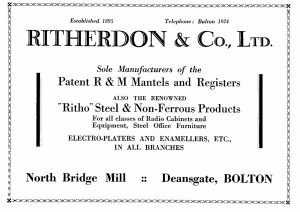 Ritherdon & Co became Ritherdon & Co Limited by registering as company number 126330. Ritherdon & Co plated many millions of parts for the War Office during the First World War. We began to produce more sheet metalwork with “The renowned “Ritho” Steel and Non-Ferrous Products” being advertised in 1929 (see the advertisement in the Gallery). Percy Ritherdon died, ending the era of magic tricks and properties manufacture at Ritherdon & Co Ltd. His son George Roland Ritherdon took over as Managing Director. Our first enclosures may have been made during the Second World War when Ritherdons manufactured electrical enclosures for the Navy’s warships. Shortly after the War we moved to our present factory in Lorne St, Darwen and our expertise in manufacturing cabinets, control panels and other specialist sheet metalwork took off through the mid 20th century. 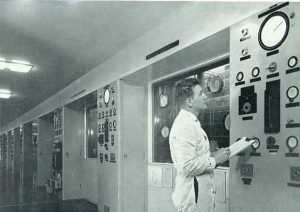 Ritherdons made sheet metalwork for the early nuclear industry, such as control panels for Calder Hall – the world’s first commercial nuclear power station – and UKAEA’s DFR reactor up at Dounreay. Other big customers included the GPO, making control panels for their coastal radio stations for many years. This is when we began to work closely with the electricity boards and several of our current products have sprung from this association. For example, it was in response to an enquiry from one of the electricity boards, over 30 years ago, that we designed the first of our door and frame units for meter box repair. Electro-plating was gradually phased out through the 1980s and 90s as part of ongoing efforts to reduce our environmental impact. The 80s also saw rapid expansion of computer based systems throughout the company, with NC, then CNC machines in the factory and more administrative work being carried out using computers such as the Apple IIs we bought when they arrived in the UK. 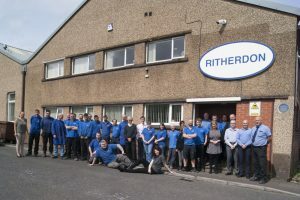 Ritherdons gained BS5750 accreditation, which later became ISO9001. Ritherdon & Co’s first Investors in People award. Following enquiries from some of our customers for street-level enclosures, we produced our first feeder pillars specialising in providing higher-quality, stainless-steel enclosures as a standard alternative for the highways market. 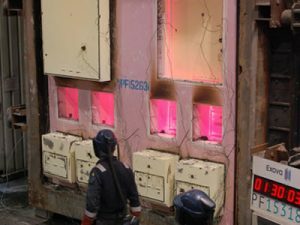 The Ritherdon range of passive fire safety products was born when we tested the FireSeal with Leeds Council for upgrading fire resistance of meter box and riser hatch doors. Also, this was the year we bought Poletech and added the Orion retention socket (later developed into the Atlas socket) to the Ritherdon highways product range. 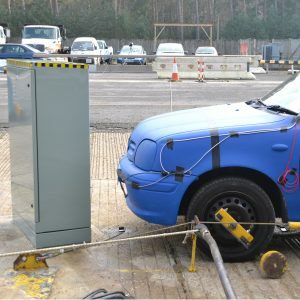 The world’s first (as far as we know) passively safe, crash-tested roadside cabinet was tested at TRL. Building on our work together developing the passively safe cabinet, Ritherdon and Manchester University set up a Knowledge Transfer Partnership together. Ritherdon & Co Ltd achieved our ISO14001, Environmental Management System certification. 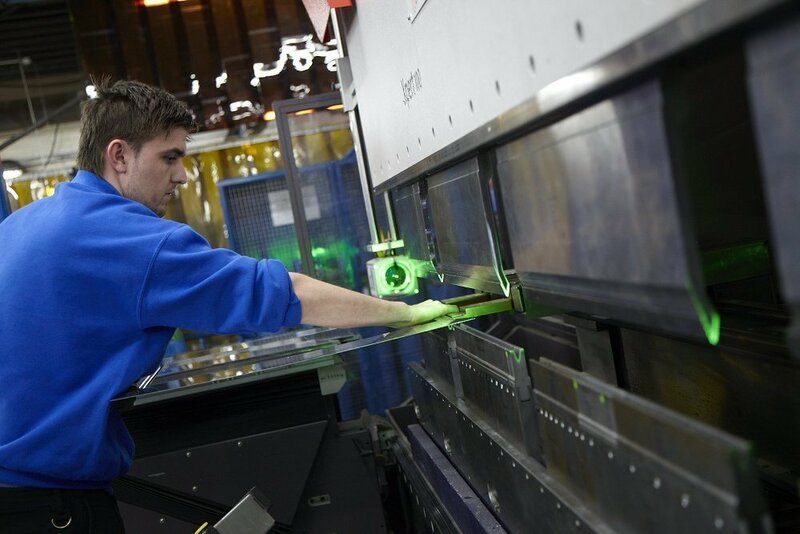 Also in 2017, we designed our ‘modular’ cabinets with Electricity Northwest, which enabled us to make larger enclosures in our Darwen factory. The PS, TBS and RMC cabinets are now used to house power supplies for buildings, construction sites and for the latest wave of rapid car charging networks being installed around the UK. 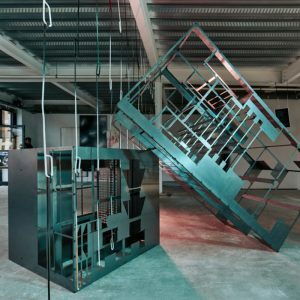 Art in Manufacturing – a commission from the National Festival of Making and Super Slow Way enabled Manchester artist Nicola Ellis to work at Ritherdon to create a beautiful installation for the 2018 Festival in Blackburn. 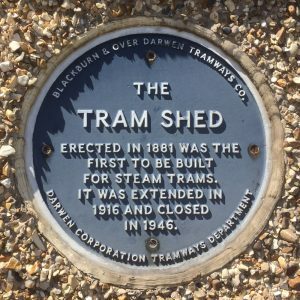 If you are interested in finding out more about the history of our company, please get in touch. Blue plaque on the wall of the factory.